Back to basics and eating an elephant in the woods. Complexity deconstructed can reveal a beautiful simplicity. We stood with an intense air, both of us silent and both of us with our our gaze and thoughts focused totally on the object that lay on a low table in front of us. It was a wheel, a rear wheel from my bike to be exact, and it wasn’t working as it should. How can a wheel not work you may ask, if it’s round and intact and has air sufficient to keep the tyre in an appropriate shape then what could possibly go wrong? 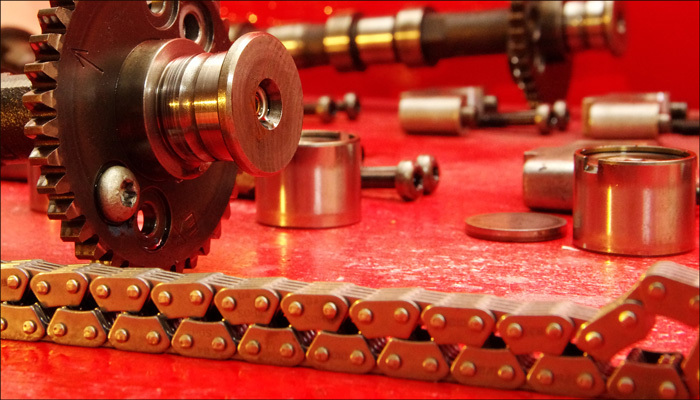 Well, many things it transpires and in this particular case it turned out to be four small studs that transferred power from the chain to the wheel itself and from there to the ground. On this particular bike there could be around 100hp passing through on it’s way to the road and these small pins are meant to play their part in the process. One though, had snapped off. This was not in itself a disaster, the bike still worked, but its progress was accompanied by clunk when either accelerating or braking and the reason was not hard to fathom, for all four had worn loose in their locating holes leaving the recesses a blunt oval shape rather than perfectly round as should be the case. The pins were moving in their location and it was just a matter of time before they all sheared off or the wheel cracked under the constant hammering. That was the problem, but what was the solution? My companion in studying the offending item was an engineer, we were standing in his workshop surrounded by the mills, presses and lathes that are the tools of his trade, Several ideas were suggested and if not actually dismissed they were modified and moulded until a consensus was reached as to a course of action that was most likely to prove successful. Essential to this process was close examination of the other components involved in securing the wheel to the bike; the locating collar, the various washers and castellated nut, and of course the axle itself which, when stripped almost entirely down to its bare self, became a thing of complex beauty with each polished surface, cut spline or drilled centre representing a function that caused this inanimate object to engage with others and so produce a whole of smooth movement and purpose. It is this ability to deconstruct and examine the elements that constitute the complete item which is the key to so much in engineering and many other human endeavors besides. Examining shapes and materials, selecting form to suit purpose and design to serve duty is the role of engineers and many others besides, in fact, all who are united by the common aim of taking the homogeneous and instilling it with character, a fact brought home to me when I was fortunate enough to share a meal with a French gentleman who had chosen a life of simple but intense experience over one of ambition and material wealth. The food was prepared in front of us as we sat at a small table in what could best be described as a unfinished conservatory, Grated carrot, tomatoes fresh from his plot and cheeses and pates that had been thoughtfully selected from the local market. He would handle all with a reverence, giving each a solemn weighing in his weathered hands before pronouncing as to whether the rind was over aged or the blood too generous amongst the fats, his words were attentive to the experience and his intelligence in the materials he handled beyond doubt. I think it the most splendid meal I have ever eaten. That same mood of assessment and calculation was obvious back in storm swept Tipperary as each part of the bike’s axle was picked up and scrutinised in a manner so reminiscent of the French gourmet. This was the mark of the artisan, the signature of the true craftsman, and it is not something that may be bought or downloaded, it is the product of experience and many years of association with the materials to be worked upon. It also very unfashionable in the world of IT driven commerce which teaches us that rapid and accelerating rates of change are the norm and to be welcomed as something wonderful. We are not to allow ourselves the time to consider the detail but we are to go with the flow, accept the whole as if there is no alternative and rejoice in the hollow and often unfulfilled promises of eternal happiness if we just subjugate ourselves to the featureless digital soup that surrounds us. The bike is now fixed and the meal remains a highlight of my times in France and what they both have in common is the attention to detail, In modern life we are so often urged to step back and admire the finished facade, not to worry our silly heads about the process or ethos which brought it into existence but simply luxuriate in the latest new thing, until the next new thing comes along that is. But does this add to the sum of human contentment? We have see the tragedy of not attending to the details as countries are bankrupted by irresponsible banking and multinational corporations have no fear of the regulation that is supposed to curtail the habits that damage our environment, and yet we continue to ignore the circumstances which brought these disasters about. The good of the human race will, I believe, be better served if we actually start to engage with the tress again rather than admire the forest. If there is an elephant that needs eating then we must do it piece by piece rather than just throw our hands up in horror at its enormity. We must be brave enough to question and challenge rather than accept and kowtow. It’s not impossible, nor is it a particularly tall order for details by nature are small, we can handle them well if taken singularly, and it is the mass accumulation of those details which is most likely to change the world if enough of us engage on our own terms rather than the terms of those who would control us. This entry was posted in Uncategorized on December 28, 2015 by Triplemanr. A QI marketing tale at Christmas. It all started with a call on the Wednesday night. 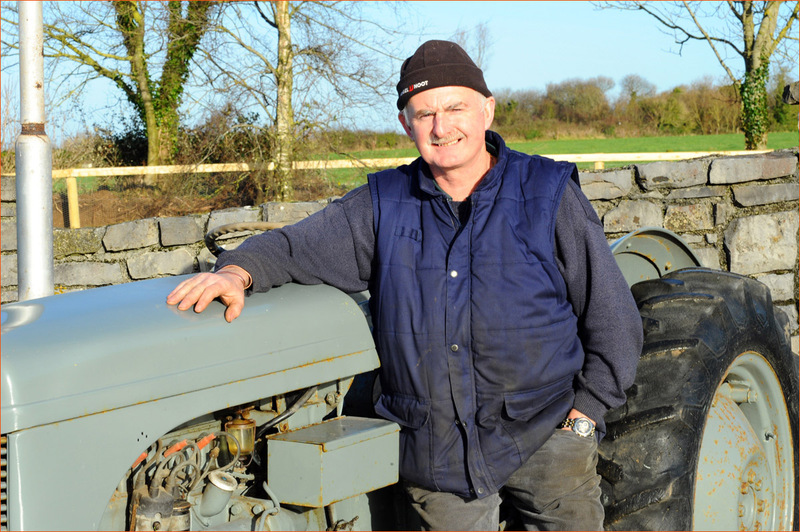 Michael Fahey rang to say that having seen the distress of the flood victims on the TV in the wake of Storm Desmond he had decided to auction one of the tractors from his collection in a bid to give them some comfort over Christmas, and could I help? Michael already does an incredible amount for charity so there was no hesitation in volunteering, it was now just a matter of sorting out the details. This was on the 9th of December, 16 days before the deadline and so time was of the essence. As soon as the word ‘auction’ is mentioned everybody thinks of Ebay, but they do like their 10% and we didn’t have the time to convince them that it was a charity sale and so not attract their usual commission. Another call was made, this time to Paul Cooke of Paul Cooke auctions in Naas, a young company, now just a year old, they have caused quite a ripple in their circle if only because they are some of the most genuine guys in the business. Would they help? The answer was yes, now what could they do for us? On Friday Michael delivered the Ferguson TE20 to their base where it was exhibited at the weekend plant sale to generate some interest, it being deemed too short notice to sell it there although it would have been the ideal occasion otherwise. Instead, the little grey fergie would go under the hammer at their commercial goods sale on the Thursday. Now, to get the word about. We had the venue, we had the date but we hardly the time to spread the news! Rightly or wrongly it was decided to establish a website with all the details and try and push traffic towards it. By Thursday afternoon a basic site was online using photos taken that morning – www.tractorauction.eu and in the evening my daughter, Hazel, popped a Facebook page up as well. Another decision was that the money raised would be channeled to the affected areas via the Irish Red Cross and they set about contacting their list of media outlets throughout the country. This resulted in a couple of local radio interviews and some attention from a handful of provincial papers but the national press ignored the story. Meanwhile, an advert was taken out on Donedeal and our own media contacts were alerted. Farm and Plant, The Farmers Journal and Irish Vintage Scene all had it on their websites within a day as did the Massey Ferguson club and their prompt response is truly appreciated. All the magazine websites carried a live link to the tractor auction website, this was not possible with Donedeal where the link would have to be copied and pasted rather than clicked upon by potential visitors to our site. As the weekend drew to a close the Donedeal site had over 3,000 views while the FB page was running at about a third of that. I personally posted it on Linkedin as did Paul Cooke where it received a couple of likes and was probably seen by 1,000+. It can’t be said how many people saw the item on the other portals but we know the numbers that came to the tractor auction site and the results make sober reading for those who think social media is the only way forward. Without going into too much detail the breakdown was roughly – 25% Facebook, 25% from magazine and club links and the rest from a direct address, which would be mainly Donedeal and, later, from the Farmers Journal article published on the day of the sale. There were no hits from search engines (hardly surprising given the short time frame) and none at all from Linkedin either, and this pattern remained more or less unchanged until the auction day itself. Let me be the first to point out that there are a million and one ifs and buts and one can’t read too much into the figures given the short space of time and small sample size. However, from our point of view paid advertising worked as did getting the news onto sites operated by the print media. Did social media make any difference to the final bid price of €2,200? We will never know, but that’s hardly the point for the sale was successful and some relief will be given to those who are living in misery this Christmas and that is what counts at the end of the day. Oh, one more thing, unprompted, Donedeal kindly refunded the cost of the advert. So to all those that helped, and I have a nagging feeling I have not done justice to everyone, a very big and heartfelt thank you from Michael and myself. We wish you all the very best this Christmas and a prosperous new year! This entry was posted in Uncategorized on December 23, 2015 by Triplemanr. Like all premier bike shows the this year’s event in Dublin was full of all the latest machines laid out and lit up to tempt the punters with the pennies in their pockets. Yet wandering the various stands of the manufacturers one can’t but help feel that there is nothing really new or strange about the bikes on show. Sure, you’d struggle to buy a bad bike off a major manufacturer nowadays as all the new models are very competent machines, but there is almost an air of inevitability about them, they are designed to fit a niche, moulded to appeal to a segment, fashioned to suit a focus group, pretty baubles conceived by a team rather than betraying a flair and originality of an intrepid genius. But then occasionally there comes along a machine so far out of the box that you have to readjust your ideas of normality to even begin to understand what it’s all about, and this year visitors were privileged have such a bike to appreciate on the Carole Nash stand. 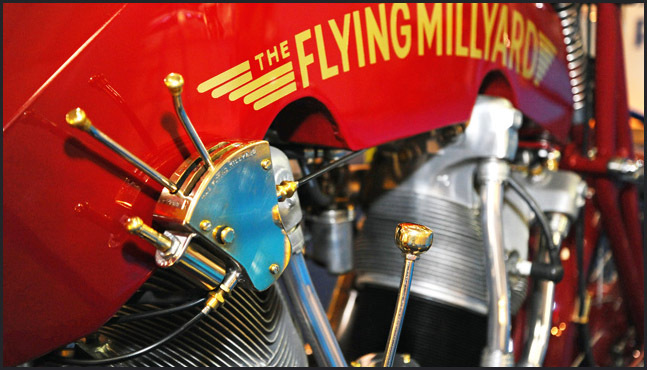 The Flying Millyard is one such creation, it goes beyond much of today’s custom builds in that not only is the frame unique but so also is the engine. There is no taking a standard Harley V Twin, dressing it up chromium finery and then arranging a novel pattern of tubes around it to which the wheels are attached, no sirree, this is the real deal, complete originality, and all done with a flair and skill that is rarely seen elsewhere. The two cylinders mounted in the heart of the machine are from a Pratt and Whitney R-1340 radial Wasp engine. This was the first motor the company ever built back in 1925 and there is a grace about their shape that suggests they are as much influenced by the then vibrant art deco movement as they were by engineering constraints. They are enthused with the optimism of the time when form and function were seen as inseparable allies in the joyful movement towards the freedom of travel which the new technology of flight promised, just so long as you could afford it that is. What better theme could there be to inform the design and execution of that other great expression of personal liberty that was exploding in popularity after the Great War, the motorcycle. But how does one take these two great innovations that went on to shake the world up through mass transportation and personal independence, and bring them together in a work of art that so strongly reminds us of both, as well as including an elegance and innocence that got shot away and left behind in the era of industrialised death and nuclear finality? The two massive cylinders of 2,240cc each are a obviously a good start. Originally they would have been supercharged and offered around 60hp apiece, but the supercharging was more a necessity to compensate for the thinner air at altitude than it would be to provide endless amounts of grunt as we tend to assume down here at sea level. Despite their capacity they are each fed with only a two inch carburetor from a Jaguar and so provide an estimated 80hp between them, although the torque can only be wondered at! The pistons and rods inside are also courtesy of Messrs Pratt and Whitney but the crank is all handcrafted by the creator, Allen Millyard, and is pressed together from the webs and pins machined on his lathe and mill. Yet all this is merely a collection of parts without another piece designed and created with no previous model or reference to go by and this is the crankcase, the essential frame for carrying all the moving components and holding them true to one another. Like the crank itself this is unique, but unlike that item this can be seen and is a prominent visual feature of the machine, it then has to be aesthetically in tune with the theme as well as perform its duties and it does both quite admirably. Its shape belies its inner workings and the finish matches the overall experience of chrome and polish. The push rods tubes emerging from its topside create an impression of arms clutching the cylinders tight to the body of the beast while the exquisite sinews of the exhaust mimics the hunger of a twin headed lamprey drawing its sustenance from the ports and excreting the fumes though the fishiest of tails. It is a thing of life and organic purpose that sets it apart from the chiseled competence of the contemporary motorcycles, it is a fluid thoroughbred conceived by the gifted individual rather than the sleek camel of various corporate departments, and all the more glorious for it. Magnificent although the engine is, it is but part of the whole, a major part granted. The rhythm of the inter war years is continued throughout the frame and wheels. Girder suspension at the front is obviously de-rigueur, as is the hard tail although the seat is blessed with coil springs to alleviate the acuteness of the latter. Wheels of stainless steel spokes and a front brake borrowed from a Kawasaki come as part of the package, as does a control lever quadrant fashioned from a Villiers flywheel. Upon this is mounted one lever for ignition timing, another for the fuel mix and a button for turning the ignition on or off. Intervening between the engine and rear wheel is a four speed gearbox from a 1938 Morris that has been braced with MG TF racing gears. At 2,000 rpm this will happily bring the bike to a 100mph top speed although 1800 revs and an 80mph cruising speed is much the preferable way to travel any distance. And Travel Allen does. Understandably it’s a summer bike for the roads of England when there no salt and a much reduced risk of inclement weather. He reports that it handles well and will zip though the lighter twists with a poise that can keep it alongside more recent and sportier bikes. The wear to the edges of the skinny Avon tyres confirms that Allen has not forgotten that bikes are ridden for a purpose and that purpose is usually the joy of riding, so despite its apparent ungainliness it appears a perfectly usable bike, although the petrol consumption of between 5-20mpg does detract somewhat from its practicality. The elevation of a mechanical fabrication to the pedestal of art is a frequently encountered cliché in the motoring world, especially so by the chattering classes of middle England as they drool over various four wheeled exotica, but here the accolade is truly deserved. 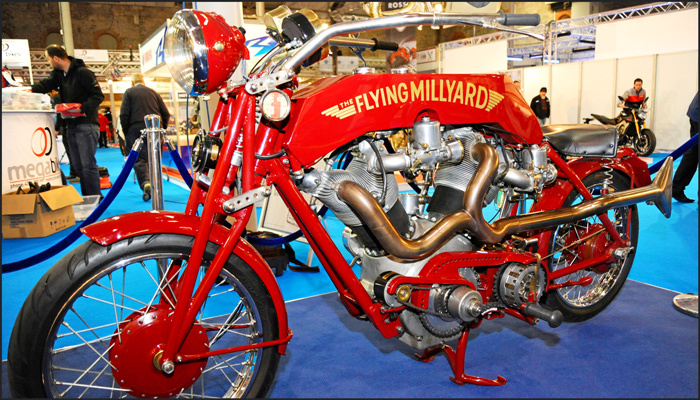 The fact that The Flying Millyard is such a success is no accident, Allen is a fully trained Machinist, apprenticed to the Ministry of Defence and a veteran builder of outllandish bikes that many have probably dreamed of but few have ever been able to make real, let alone in such an appealing and natural way. A trained engineer he may be yet he is also an artist, one that can weigh some material in his hand and imagine possibilities that are beyond the ken of the rest of us. It’s not just a skill, but a rare gift, and we are fortunate that he expresses his vision through the medium of proper motorcycles, machines that function and please with their work, rather than messy beds or pickled sheep. This entry was posted in Uncategorized on December 5, 2015 by Triplemanr.